Join us for a free 90-minute tour of Niakwa Park. 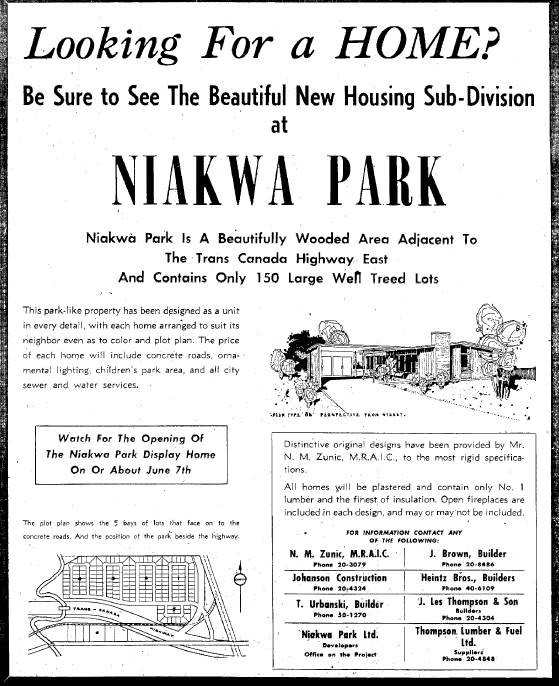 Located north of Fermor Avenue, south of the Windsor Park Golf Course and adjacent to the Seine River, Niakwa Park is a park-like neighbourhood developed in the 1950s. The area’s homes were designed by Nikola Zunic, a 1950 graduate of the University of Manitoba School of Architecture. The name Niakwa is derived from an aboriginal term for “winding river” and was earlier applied to the Niakwa County Club, established to the south of the Niakwa Park area in 1921.